What is new in the ergonomics of sitting at an office workstation and office chair design? People sit rather than stand for obvious reasons of comfort; only lying down is more comfortable, but hardly practical for working. The problem arises when we sit for too long at a desk or any workstation for hours and hours, day after day, year after year. The office is one environment where sitting typically takes the highest toll. The most common adverse effects of such prolonged sitting are discussed in the OSH Answers document Working in a Sitting Position - Overview. Despite much research and study over the last few decades, health effects associated with working in a sitting position persist. 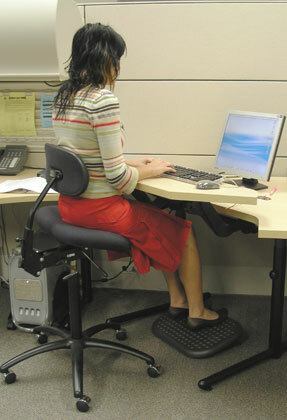 The number of people suffering postural problems and back pain through excessive sitting is not decreasing. Even the concept of an ergonomic chair that was developed in the mid 80s, and widely adopted since then, has not contributed to any dramatic improvement in such health problems reported by seated workers. Some experts believe it is time to re-think the entire concept of "proper" sitting and good chair design, but such notions are not entirely new. They go back to the concept of sitting described by A.C. Mandal in The Seated Man: Homo Sedens (Dansk Tidsskriftryk Copenhagen; 3rd edition, 1985). Mandal's core belief is that maintaining the lumbar curve found in the small of the back is absolutely essential to a healthy pain-free back. The majority of guidelines, including our own OSH Answers document (Working in a Sitting Position - Good Body Position, and How to Adjust Office Chairs) however, suggest sitting upright with an angle of approximately 90 degrees between the torso and thighs which actually flattens the lumbar curve. A flattened lumbar curve increases both the mechanical load on your lumbar spine as well as back muscle activity. As a consequence, sitting upright with the thighs horizontal (i.e., parallel to the floor), may lead in the long run to chronic low back pain (LBP). It was also found that while you lower your body to sit down, the lumbar curve stays unchanged until the last 20 degrees before your thighs become horizontal. In conclusion, without going further into a detailed biomechanical analysis of how the curvature of the spine works, people who need to sit at work could try using a chair with a forward-sloping seat pan as an option (especially if they are experiencing pain with a horizontal (flat) seat pan / 90 degree angle between the thighs and back). Such a chair should allow you to maintain the angle between your torso and thighs at about 105 degrees while keeping your feet flat on the floor or supporting them on a footrest if it is more suitable - see Figure 1. What are benefits of a sloping seat? It decreases the load on your lower back and minimizes the risk for lower back pain (LBP). Sitting with your thighs in a downward slope increases the activity of your lower leg muscles. As a result return blood flow from the lower legs is improved, and there is less pooling of the blood and pain in the lower legs by the end of the workday. Consequently, in the long run, it can reduce the likelihood of your contracting varicose veins. Much more than a horizontal seat pan, a sloping seat pan not only makes rising from the chair easier, but also allows your leg muscles to recover sooner because any postural changes and shifts are also easier. Once you make the transition from a conventional horizontal seat to one that tilts forward, the next step is to consider using a slanted desk surface, which would reduce bending in the neck and upper torso, thus improving your postural comfort. Yet, of all advantages of the forward sloping chair, it is most beneficial to have more freedom (choices, options) of body positions (or work postures). Frequent changes makes sitting more dynamic rather than static (maintaining fix position) and easiness arising (standing instead of sitting) allows loaded muscles recover faster and postponing fatigue and discomfort. What are disadvantages of a sloping chair? The major disadvantage reported is the feeling that you have to constantly counteract gravity to avoid sliding off the chair. The seat pan of such a chair has to be curved from front to back to allow sitting on chair without sliding. Nevertheless, you do have do exert some muscular effort in your lower legs to remain seated. This effort is in fact beneficial (providing the slope is not greater than 15 degrees) because it improves the return blood flow from your lower legs. The other disadvantage frequently quoted, of having your clothing ride up your legs can be overcome if the chair is properly designed with a non-slip covering. What is the possible future of seated jobs? Over the last few decades we see more and more sedentary jobs where workers are seated throughout much of their working day. The traditional design of office furniture and poor job design often result in lower back pain. While a forward-slopping chair seat may not be the ultimate remedy, it is one viable option that may be beneficial (and a new chair is much less expensive than the cost and suffering a person experiences with low back pain).